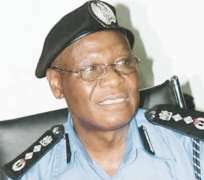 The Independent Corruption Practices and Other Related Offences Commission (ICPC) on Wednesday re-arraigned a former Inspector-General of Police, Sunday Ehindero, and a former Commissioner of Police, John Obaniyi, over alleged N16.4 million fraud. The accused were again arraigned on a 10-count amended charge before an FCT High Court sitting at Apo. The charge borders on conspiracy, fraud and making false statement. The former police chiefs, however, pleaded not guilty to the charge. The prosecutor, Mr O.G. Iwuagwu, told the court that the accused committed the offences from May 2006 to November 2006. He said that the duo conspired and used their positions to place N500 million in two fixed deposit accounts. Iwuagwu said that the money was part of N557,995,065.00 donated by the Bayelsa Government to the Nigeria Police for purchase of arms and ammunition. The prosecutor said that the N500 million placed in fixed deposits yielded an interest of N16, 412, 315.06. The News Agency of Nigeria (NAN) reports that the alleged offences contravene Sections 26(1) and 22(5) of the ICPC Act, 2000. Counsel to the accused, Messrs Kenneth Onorun and Samuel Obairko, prayed the court to uphold the bail granted to them when they were first arraigned. They objected to the prosecutor’s application for the court to proceed with evidence by a prosecution witness who, the prosecutor said, was ready to testify. The defence counsel submitted that the statements of the accused were not served along with the amended charge. Justice Sylvanus Orji directed the prosecutor to serve the defence counsel with the statements. He adjourned the case until Jan. 8 for hearing.